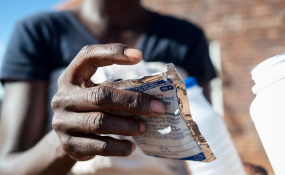 A woman holds a packet of pills at an activist meeting in Soshanguve, a township outside of Pretoria on April 16, 2015 (file photo). There is a large unmet need for contraceptives among Namibian women, with only 50 percent of women having access to contraceptives, says the United Nations Population Fund (UNFPA). Assistant Representative, Loide Amkongo, said at the launch of the 2018 State of World population report titled, "The Power of Choice: Reproductive Rights and the Demographic Transition." "This report is about global fertility trends, but it's most importantly about choice - or a lack of it - and what that means for women, couples and for countries' prospects for development," said the UNFPA Country Representative, Dennia Gayle, at the launch of the publication on Wednesday. Gayle said there are 214 million women in the developing world who are at risk of unintended pregnancy because their reproductive choices are limited by a lack of modern contraception and other compounding factors such as poverty, socio-cultural and gender norms. "As a result, in much of the developing world, women are having more children than they want," said Gayle. She remarked that choices are limited in more developed countries, where women are having fewer children than they want, often for economic reasons. "The high cost of child care or the high opportunity cost of leaving a career to start or expand a family, are just some of the main reasons why women are unable to exercise their right to freely and responsibly make decisions about the timing and frequency of pregnancies," said the country representative. In an effort to address high or low fertility over the years, some countries have taken actions that restrict choices and violate women's rights, sometimes by cutting off family planning, sometimes through coerced sterilisations, said Gayle. The State of World population report calls on countries to confront their demographic challenges not through fewer choices, but rather by enhancing rights and choices. Making sure that childcare is affordable is one action that a low fertility country can take that enhances rights and expand choices, said Gayle. This enables women to start or expand families without giving up their careers. "Making sure that, for example, a 10- or 15-year-old girl has access to the information and services that will empower her to prevent an early pregnancy or an HIV infection, will enable that young girl to remain in school, attain her education, join the labour force of her country and contribute to the development of her family, community and country," said Gayle. This is good not only for the individual. But also good for any nation's economic development. "Imagine what that would mean for a country like Namibia in the next 12-15 years. Our 10-year-old will be 25 and our 15-year-old would be 30. Therefore, strategic policy investments in education, employment and empowerment will be crucial to shaping this nation's prosperity when we, along with the rest of the world, will be hailing the realisation of the Sustainable Development Goals," she said.